As it turns out, today is the day that my puppy is not really a puppy any longer. Miso the dog turns two today. It should be noted that I am not a dog person. Or, perhaps more accurately, I am a reluctant dog person. Previous to the appearance of Miso in my life, I was the sort of girl who could sort of appreciate the idea of dogs, provided that they didn't touch me or get too close. That sort of thing. But then: Miso. It is ridiculously difficult not to be charmed by a creature that follows you everywhere and responds to your very existence with complete enthusiasm and joy. I mean, who says no to that? He is love in canine form, and I'm all in. I have become that crazy lady that shows strangers pictures of my dog. At night, I let him sleep with his nose on my shoulder. I find myself making scheduling decisions based on how long I can feasibly be away from him without either one of us feeling sad. It is inexcusably dorky, but also makes me pretty happy. Run Like You're Being Chased. A couple of weeks ago, I ran the New York City half-marathon with my little sister, who lives in Manhattan not far from Central Park. We fueled up on significant quantities of Mexican food the night before, and arose at what can only be considered an unseemly hour the day of the race. "Race," however, is an interesting word for the whole phenomenon because I was certainly not trying to beat anyone at anything. My goal was, essentially, just to finish. Which I did. And, I had a pretty good time doing it. The first eleven miles or so were actually fairly easy, and it wasn't until the last couple of miles that I found myself having to frequently refocus and come up with distracting things to contemplate while running along. There were 20-odd thousand other people running, so I suppose the effect of mass momentum cannot be underestimated. Oh, in other news, there is a great giveaway over at Mud Puddles. Just open for one more day, I believe, but if you miss out, be sure to check back at the end of the week for another cool giveaway (from our publisher!). Sloth Skeletons and Refrigerator Pickles. So, things got busy and I disappeared from the Interwebs almost entirely for some days, and now I am sort of back, but have nothing to show for my time away aside from a photo of a dock in Maine and a picture of a fossilized giant sloth. Right. But this is not because I haven't been doing things. I have indeed. I went to Colorado for a week with my smalls and enjoyed things like airport trams and crisp mountain air. I went to Maine two weekends in a row, and can definitively say that I would recommend doing so to my friends and neighbors alike. I got semi-settled in at the new middle school teaching gig, and trained somewhat sporadically for a half-marathon that I am supposedly running in about three days time. Oh, and I moved to a new apartment. I also made some seriously delicious refrigerator pickles, but feel like maybe this isn't quite momentous enough to sit well with the rest of the items on this list. But I guess it's all a matter of perspective. 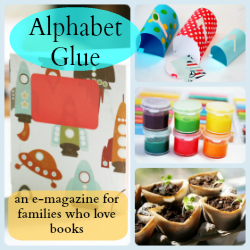 Alphabet Glue: A Warm Welcome for Volume Sixteen! It took just a bit longer than I was hoping, mostly due to things like busy toddlers, but I am pleased to report that the newest installment of Alphabet Glue is ready at long last. Dawn jumped in with both feet on this one, and I truly could not have built this issue without her. Indeed, I wouldn't have even made the attempt. So a big, big thank you to her. Truly. This latest volume of Glue is full of great science and literature inspired projects and printables for all. You'll find migrating birds, mysteries of melting points, libraries sized for matchboxes, and so much more in the pages of this issue, and I sincerely hope that you'll have a grand time doing it. You can read up on all the details of the latest issue and download a copy of your very own by visiting the Alphabet Glue site here. Or, if you already know that you're all in, simply click the button below to download the new Glue directly from this post.